Directions: From Truckee, on Highway I-80, go East 6 miles and turn North on Stampede Meadows Road. Go 1.5 miles to reservoir. 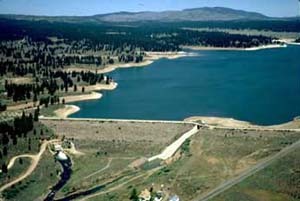 Boca Reservoir (ele:5,700 feet) covers 1000 acres and is open year-round with a five fish limit. It is planted with about 11,000 10-12 inch rainbows each season. The lake contains Browns, Kokanee and some Mackinaws. This is mostly a trolling-type lake with many bait fishermen. Flyfishing is best from the point opposite Boca Rest and the inlet of the Little Truckee River. Like Stampede Reservoir, early Spring after ice-out and Fall are the best times to flyfish when the fish are feeding in the shallows. Nymphs and Streamers are effective. In late winter or early Spring, use Streamer patterns at the inlet cove. Try Olive, Black or Yellow colorations. A Little Black Stone Fly hatch occurs during the late Winter/early Spring. Try using black nymphs and stimulators (#12-14).